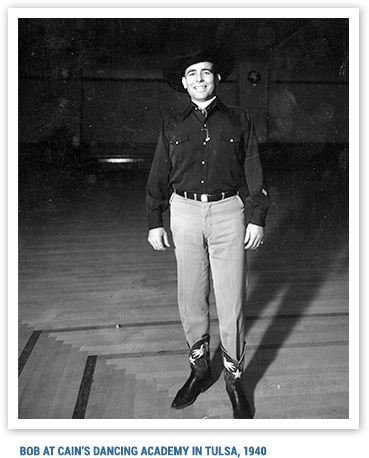 The “Bob Wills dance” was an institution in the south-central Midwest in the 1930s, synonymous with fun. People who scrounged up the quarter or so it cost to get in knew they would get at least a 4-hour respite from the crushing Great Depression. People in and around Tulsa knew that Cain’s Dancing Academy was the place where Bob played every Saturday night. He and the band also did live radio broadcasts on KVOO-Tulsa on those Saturdays and every day at noon. They traveled from there, performing a grueling regular circuit for years and always getting back, sometimes after dawn, to make that noontime radio show. Thus, the 1941 song “Take Me Back to Tulsa” came into being. The four best-known tunes, “Take Me Back to Tulsa,” “Steel Guitar Rag,” “Faded Love,” and “San Antonio Rose” show the versatility and freedom Bob wanted to create and allow his band to enjoy. “Take Me Back to Tulsa” is basically a fiddle tune featuring some spectacular breaking of meter, with catchy lyrics and devilishly intricate instrumentation. “Steel Guitar Rag” was Leon McAuliffe’s elaboration on an earlier blues piece called “Guitar Rag.” The 1936 recording features a piano solo by Al Stricklin and a heroic saxophone solo by Ray DeGeer. “Faded Love” became something of a country music standard and showed how, even in a song with positively mournful lyrics, Bob was determined to make the tune danceable. 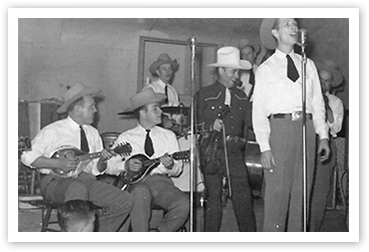 “San Antonio Rose” started life as a 1938 instrumental version featuring fiddle and steel guitar, something of a reworking of “Spanish Two Step,” and then became a huge hit in 1940 after lyrics were added. The song is the Bob Wills tune everybody knows, even if they don’t know it came from him. It has been covered by countless artists. The vocal remake has a big band sound, plenty of horns, no fiddle or steel, and a fine vocal by Bob’s main singer for many years, the great Tommy Duncan.